After having a good year, the country's second largest commercial vehicle maker, Ashok Leyland, has said it is bullish about 2018-19 and that it would outpace industry growth, which is expected to be around 10 per cent in fiscal 2019. Dheeraj G Hinduja, chairman, Ashok Leyland, said that 2017-18 has been another year of stellar performance by the company when it pushed the limits even further with the highest ever sale of 174 ,873 units , crossing the 100,000 Medium & Heavy Commercial Vehicles (M&HCV ) truck sale in a y ear and rolling out it 200,000th Light Commercial Vehicles ( LCV) on the road. Achieving a record revenue of Rs 262.48 billion and a profit of Rs 15. 63 billion, together with sustaining market share gains in a competitive environment is quite commendable, Hinduja added. In a letter to shareholders, he said, there were some tailwinds during the year in the form of GDP growth at 7.4 per cent, thrust in infrastructure and road construction, proliferation in logistics activities and overloading restriction in some markets. "Nonetheless, in the face of fierce competitive pressures and intrinsic challenges in demand prediction, to sustain market share across segments without sacrificing profitability is a culmination of the management's painstaking efforts of the last few years to strengthen the company through the strategic levers of operational efficiency, appropriate products and market reach," he said. To sustain company's growth momentum and take a great leap forward, the company is gearing to set globally benchmarked standards in reliability and after-market support. He said that there will be added thrust on cost control, cash generation and ROCE. To accelerate growth, Ashok Leyland is launching two product platforms this year. One is the high horsepower range of vehicles, namely tippers and tractors. Second is the world's first 41-tonne with 5 axles with twin tyre lift. "Furthermore, ambitious plans will be rolled out soon to grow the LCV business, International Operations and Defence mobility even further," he said in a letter to the shareholders. On electric vehicles, Ashok Leyland will leverage on the proven success of the Optare range in United Kingdom to position integrated offerings that straddle developed and emerging markets, said Hinduja. Ashok Leyland holds to 99.08 per cent in Optare. 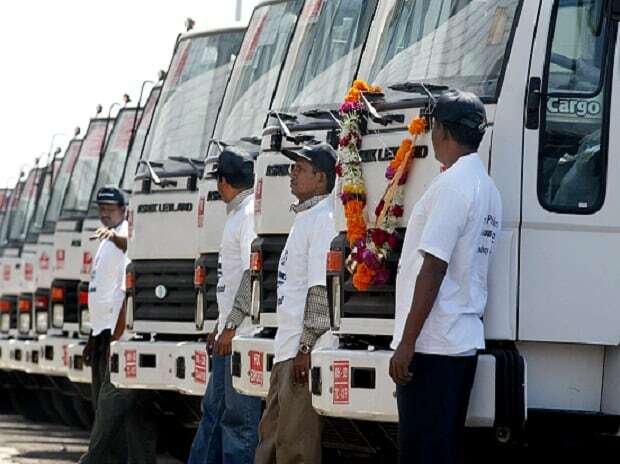 "Having performed well in the recent years in the highs and lows of this business, I believe Ashok Leyland is at a striking distance from being among the Global majors in the commercial vehicle field with attributes of operational efficiency, cost control, quality and reliability and product innovation," he said. Ashok Leyland is quite bullish that the infrastructure led demand will continue. GDP will continue to grow on the back of GST, the hub-and-spoke model will continue to play in the company's favour, and international markets are also expected to do well. Ashok Leyland is continuing to do well in domestic truck business. But equally, the company is looking at other business segments covering LCV, Defence, After Market, Customer solutions to grow them at a faster pace than the truck business so that ALL will be less prone to cyclicality that the truck industry is known for. ALL will not give away the margin for the sake of marketshare or for commodity price increases. "We will strive to continue to maintain margins in double digits," he told shareholders.